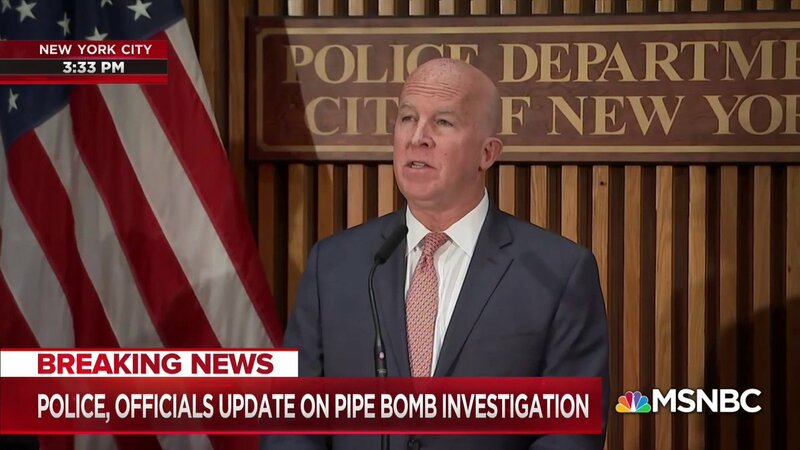 Authorities from the FBI, NYPD, and New York Mayor Bill De Blasio gave an update to reporters today in New York about the series of explosive devices sent to former presidents and public figures, and the news network CNN. Here's a loose summary of what we know, after their briefing on Thursday afternoon, 3-4pm Eastern time. At least 10 devices were sent to prominent Democrat targets, and people who were critical of Donald Trump. The devices are on their way to a federal laboratory in Quantico, Virginia, for forensic analysis. The presumed pipe bombs were sent to former President and First Lady Barack and Michelle Obama, former President and First Lady Bill and Hillary Clinton, philanthropist George Soros, actor Robert DeNiro, Rep. Maxine Waters (D-CA), former vice president Joe Biden, former attorney general Eric Holder, and hundreds of journalists at CNN's New York offices. Some targets got more than one bomb. "We are treating them as suspected explosive devices," said James P. O'Neill, Commissioner of the New York City Police Department. White powder found in the packages has been determined NOT to be a biological agent, such as Anthrax, as feared. Authorities would not comment on whether the packages were identical. We know that some were delivered by U.S. Postal mail service, and others by courier. "We will identify and arrest the person or people responsible for these acts," said O'Neill. “This is something that should be taken seriously, we are treating them as live devices,” said O'Neill. “This has to be taken with the utmost seriousness. As far as a hoax device, we are taking it seriously. Is it terrorism, asked a reporter? “It is absolutely terrorism,” says NYC mayor Bill de Blasio. “It is possible that further packages have been or could be mailed,” said FBI Assistant Director Sweeney, adding, "We are actively investigating tips you have already provided." "We are discovering things by the hour," adds NYPD Commissioner O'Neill. "Whatever the motives of the individuals involved, the people of this city are not being thrown off their game," says @NYCMayor.